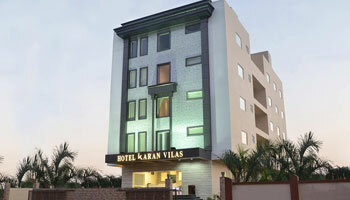 Situated minutes away from city's all major tourist destinations and travel centers yet far from the hustle bustle of the town, Hotel Karan Vilas provides you an opportunity to relax and rejuvenate yourself in a calm and soothing environment. We offer customized services to fulfill your every wish and command and your satisfaction is our ultimate goal. Our professional staff is trained to take great care of you and your family's comfort. Currency Exchange, Security Guard, Airport Transportation, Travel Counter, Doctor on Call, Room Service, Laundry Facilities, Backup Generator, Breakfast Services, Parking. Toothbrush/Razor on Request, Cable/Satellite TV, DVD Player, Wakeup Calls, Air Conditioning Room, House Keeping, Iron/Ironing Board, H/C Water, Attached Bathroom.